Today's guest post is from Lana, an architecture student and interior decorating fiend. She shared 4 Mini-Projects That Will Refresh Your Home back in May, and today she's here with some drool-worthy kitchens! Check them out. Scandinavian people just know how to keep things to the minimum but make it look stylish, gorgeous, and functional. To embrace the real elegance and functionality of your kitchen, you should dress it just like our friends from the North would. This style is all about gentle and bright colors that can introduce calm and bright atmosphere. Cover the floor with light colored beach wood, and avoid using too many rugs on it, since it opens up the room and makes it look fresh and big. 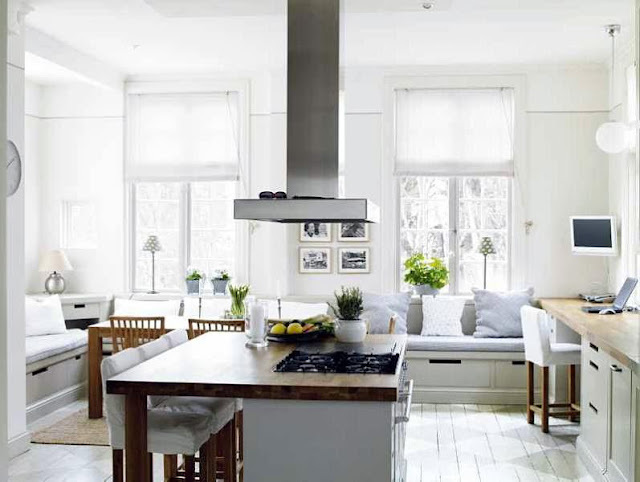 Also, the all-white look enables you to easily match your small accessories with the entire kitchen. Bigger pieces of furniture can be completely white, and you can bring character through hints of beige, gray, and potted plants for a better ambient. This calming atmosphere will make your kitchen more enjoyable and you will love spending your time preparing delicious muffins, Swedish meatballs, and cakes for your family. Scandinavian style is bare, but is fun and comfortable. To fill your empty and sleek kitchen, you should introduce textures that are common for other parts of the house. Cover the wooden floors with some stylish and cheap rugs that will bring warmth and color to the kitchen, and on the seating you can place some tasseled cushions or faux fur. There is no doubt that every piece of Scandinavian furniture is a true piece of art that will last forever. That is why you should incorporate different elements of their furniture in your kitchen. The great attention to detail of Scandinavian manufacturers will bring fun into this room, and the smooth curves and lines of the furniture will make it look simple and elegant. Take a trip to the famous IKEA and see what best fits your kitchen, go with gentle colors and fine lines, and you will completely transform the kitchen. Even though their designs look somewhat modern and minimalistic, Scandinavians adore showing off their vintage and eclectic crockery. If you have any vintage plates, teapots and cups, especially if they are decorated with symmetrical motifs, it is time to bring them down from the attic and incorporate them into the kitchen design. The best way to do so is to show them off on simple, open shelves and make the whole space look less cluttered. There is no doubt that your kitchen will immediately become more interesting and vibrant. In order for everything to look good, it has to work well and even be multifunctional. Since this whole design looks empty and clutter-free, you have to make sure to buy the furniture and appliances according to that characteristic. Turn your kitchen island into a countertop and a classy wine cabinet that is easily accessible and neat. Also, make sure that all the space under the sink and countertops is fully used up and that you can easily store all the necessary things there, and leave the counters free of any items. Another important trait of this design is that everything has to work properly and you should avoid keeping any old appliances and dishes. Schedule new stove installation, have regular electrical and plumbing installation checkups, fridge cleaning, and basically keep your kitchen clutter-free. After everything is in order, then you will embrace the real Scandinavian design. Scandinavian countries have up to 60 days of Polar Nights, and that is why the daylight is essential, and the whole bright interior should be embraced. 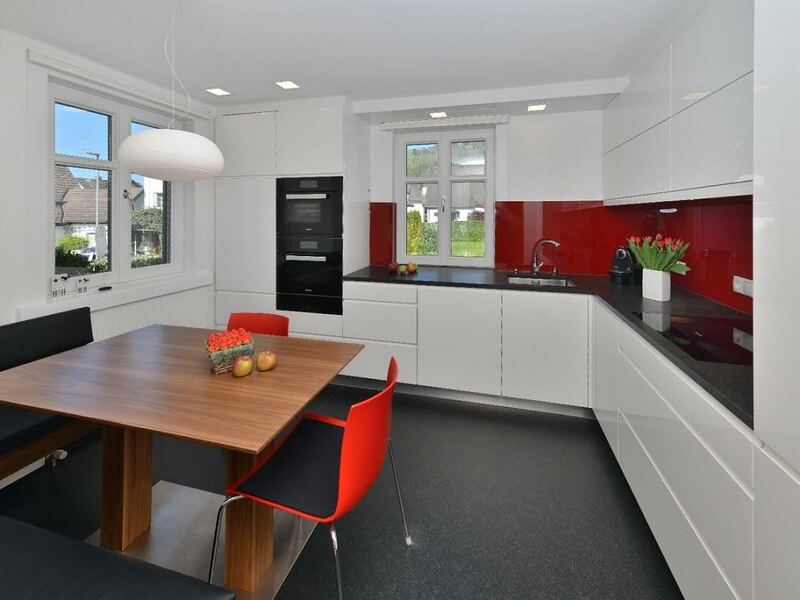 So, in order to take advantage of springs and summers, Scandinavians have thought of a kitchen design that is open and lets all the possible light inside. Take their advice and build big windows in your kitchen. Not only will you open up the space and make it look much bigger and fresher, but you will provide enough natural light. This is a great way of preserving health of everybody in the house, making everyone feel better and your bills will decrease. Do not be afraid to open up your kitchen to the nature and embrace the warmth of the sunlight. For a much better mood and atmosphere in the kitchen, you should try out this Scandinavian design. Incorporate bright colors and simple furniture, and the kitchen will become the favorite place of your whole family. LOVE THIS POST! All of these pieces are so crisp and clean but make the house look like a home! I love it too! So pretty! Love white or light colored home decor! Our kitchen is white, it was renovated right before we moved in by the previous owner and while the cabinets are not my style I just remind myself that I didn't have to do it. Also, they are Ikea cabinets and it's easy to change the fronts. With that said cleaning white, with little ones in tow, is not difficult. Yes you will see the dirt but at least you will know when it is clean and when it is dirty. :) I love using a Mr. Clean Magic Eraser! They are amazing! It's always good to think about making your home kid friendly but you also want it to be your style. They won't be kids forever :) Great guest post! That's awesome! I love white too- magic erasers sound like a dream! I've been debating painting my kitchen cabinets white, and now I really want to! I don't have a ton of natural light in my home, and I think this would be a great way to brighten things up. Totally! I've found that natural light can be faked with some good paint and brightening of the room! Pretty! I like the first picture you showed a whole lot. I usually don't like scandinavian style decor, but that was pretty! Thanks!! I love that one a lot too. YES YES YES!!! These all look so CLEAN and CHIC!! Exactly what I want once we buy our own home. I love the white and the natural light so much! Great post! For sure, me too! Totally in right now. Thanks for reading! I'm all about white kitchens at the moment. I'm hoping to create my dream kitchen in a few years! Great post!